It has been some time now since I attended my first academic conference and, while I have still not finished converting my paper into a published article, I thought that I might share with you what that paper actually was. It was entitled, “The Biblical Hebrew Locative-Heh: A Fresh Look at the Evidence”, and you can read the abstract here. The following is the text of my actual presentation, coupled with the hand-outs that the attendants were given. I will take this opportunity here just to note that the abbreviations EBH and LBH stand for “Early” and “Late Biblical Hebrew”, respectively. It is interesting just how many studies of linguistic dating commence with Franz Delitsch’s famous remark, “If Qoheleth was composed in Old Solomonic then there is no history of the Hebrew language”. Every language has a history, mapped out by the diachronic syntactic and lexical developments that have taken place within it. The tacit assumption that underlies all methods of linguistic dating is that we are able to chart these diachronic developments from our own vantage point, recognise them for what they are, and assume a certain degree of faithfulness on the part of the various authors who represented their form of the language when they were writing. Should any of these assumptions be incorrect, our results must necessarily be somewhat flawed. While it is not my intention to comment upon the functionality of linguistic dating, it is my intention to comment upon one particular item of concern in charting the diachronic development of Biblical Hebrew. This item is the so-called locative-heh, a morphological suffix that is understood, broadly speaking, to denote ‘direction towards’, ‘direction away from’, or the location of an event. It may even, in very rare cases, denote movement through time. It appears with both nouns and adverbs, although far more frequently with nouns and, in the majority of cases, denoting direction towards. It is for this reason it has been named a locative, despite the fact that it is also recognised in some clauses that do not seem to bear a locative meaning. The reason that this item is of relevance is that it has classically been understood to decline over time. According to this theory, the locative-heh was prolific in the oldest texts and, in the later texts, virtually absent altogether. By the time that we get to the Mishna, the locative-heh only appears in Biblical quotations and, even earlier, it appears in the Dead Sea Scrolls and examples of LBH literature with less of an awareness as to its purpose. In other words, it tends to appear alongside the preposition that, semantically, should make the suffix redundant. This theory was bound up in many ways with what our expectations were regarding the suffix, and not with too close an analysis of the evidence. Based on the assumption that the locative-heh was a petrified accusative case ending, scholars believed that it would have been more common at a time when the case endings were in greater use and that its role would have declined as other forms of the language (such as the preposition) came to replace it. The analyses that were conducted of the LBH literature seem to have been made with this expectation in mind, for a closer look does not reveal that this is in fact the case. I have conducted a series of case studies that relate to the appearance of this suffix in Chronicles – a text that, on numerous historical, linguistic and stylistic grounds, is considered by scholars to be an example of LBH. I have found, almost consistently, that the usage of the locative-heh in Chronicles is no less frequent than its usage in the rest of the Bible, that in some instances it is used more often than in the core-EBH literature, and that in most of the instances within which it is eschewed in favour of the preposition, the words with which it is failing to appear are words that rarely (or never) take the locative-heh suffix at all. Before I present these studies, a brief word on methodology is in order. I have understood the core-EBH literature as embodying Genesis through Kings and the core-LBH literature as comprising Esther, Daniel, Ezra-Nehemiah and Chronicles. My focus has been on Chronicles and a broader analysis of the phenomenon is thus necessary before any sweeping conclusions can be made. In analysing Chronicles I have focused only upon those morphemes that, by nature, can receive such a suffix. I have thus discounted names of people and nations, participles (even when functioning as nouns) and masculine plural construct forms. I have also disregarded verses that are only dubiously locatives, such as where an action is performed “until”, “as far as”, “against”, “into” or “throughout” a particular noun. Where two verbs operate together, I have understood the second of the two to be the operative verb; likewise, where there are two nouns I have only assumed that one requires the locative-heh. 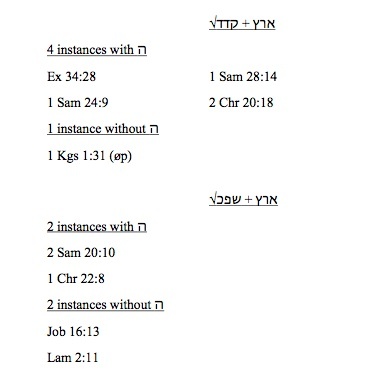 An example of the former would be Gen 4:17 (לכו־באו ארצה, in which case √בוא is the operative verb) and an example of the latter would be 2 Sam 24:7 (ויצאו אל־נגב יהודה באר שבע, in which case there is only one zero-instance: either נגב or באר). I have indicated the presence of an “absolute zero” instance, being the absence of both the suffix and the preposition, with øp. Also, despite the caveats of some scholars I have seen fit to include the synoptic sections of Chronicles as relevant, even though they may shed more light on the sources that were available to the author than on the author’s own choice of words. I have also seen fit to include clauses that may have constituted a fixed expression without the locative-heh, although a more thorough analysis of the syntax in each of those cases would be necessary. Finally, it remains to be said that I have not succeeded in finding every instance. I used Accordance 6.9 (BHS with Groves-Wheeler Westminster Hebrew Morphology) which, while a remarkable piece of software, is not yet sophisticated enough to isolate so many grammatically-specific occurrences. Where I stumbled across one that, for various reasons, was omitted by the search, I included it. Of the roughly 1000 instances that the locative-heh turns up in the Hebrew Bible, Chronicles features this suffix some 80 times altogether. While this figure may pale in comparison to the 396 instances of the locative-heh in the Pentateuch one would do well to remember the fact that Chronicles is but one book. Jan Joosten, in an article on LBH (Joosten, J. “The Distinction Between Classical and Late Biblical Hebrew as Reflected in Syntax”. 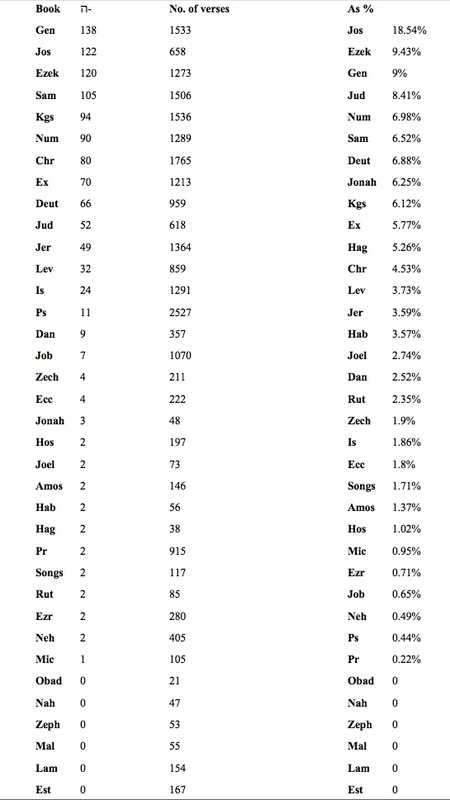 Pages, 327-339 of Hebrew Studies 46 (2005)), mentioned that the locative-heh turns up some 752 times between Genesis and 2 Kings. I found 769 such occurrences, although the difference is minor. What is important to realise is the fact that the corpus stretching from Genesis to 2 Kings is almost 6 times as large as the body of literature included in Chronicles. 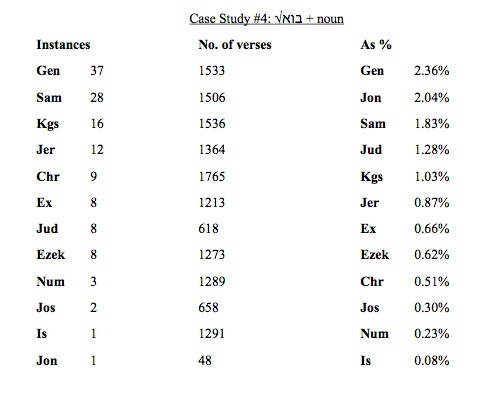 If Chronicles were to continue with the same proportion of locative-hehs for the same number of verses then we should expect to find 461 locative-heh suffixes in Chronicles, or almost 60% of the number found in Genesis to 2 Kings. As the chart demonstrates, Chronicles ranks reasonably highly in its number of locative-heh suffixes, but fares rather poorly in its concentration. As I hope to demonstrate, however, this is due to the choice of words within each of the individual clauses. Several of the lexical items found within the zero-instances of Chronicles are actually unpropitious for the locative-heh, and never take the suffix elsewhere within the Hebrew Bible. Furthermore, as the following case studies will also demonstrate, the EBH corpus can not be found to be so consistently supporting the usage of this feature either, and that its utilisation may simply have been one of authorial style. Of the twenty-two instances within which ארץ serves as the direct locative object of √שוב, one occurs in Chronicles where it features a preposition instead of the suffix. Despite the fact that Chronicles is neither quoting from, nor paralleling, a passage elsewhere, it is nonetheless in good company. There are seven such zero-instances in the hexateuch (five of which alone are in Genesis) and one in both Samuel and Kings. The sole text to employ the locative-heh for this verb/noun combination is Exodus, which employs it only once and has no zero-instances of its own. It is also of interest to note that three texts, two of which are from Jeremiah (thought by some to feature EBH syntax), feature neither preposition nor locative-heh. It must, of course, be borne in mind that the results of this particular study are skewed by the irregularity of the occurrences. The fewer the overall number of possible incidents, the less the overall percentage is of relevance. Nonetheless, we see here that Chronicles ranks higher than most with its number of positive instances, and that it has fewer zero-instances than most of the texts considered to feature EBH syntax. While Samuel features the most staggeringly high proportion of instances to zero-instances, Chronicles nonetheless ranks higher than Judges, Joshua and Genesis, and is roughly on a par with Kings. From this first case study there is no basis whatsoever for the assumption that locative-heh suffix forms in Chronicles are in any way reduced. This example constitutes the one with the highest number of zero-instances from Chronicles. While the text in question only yields a mere three instances with the locative-heh, it also contains some nineteen instances where one might have expected the suffix to have been employed. As one might expect, Genesis, Samuel and Kings all feature large amounts of locative-heh instances with the verb √הלכ. 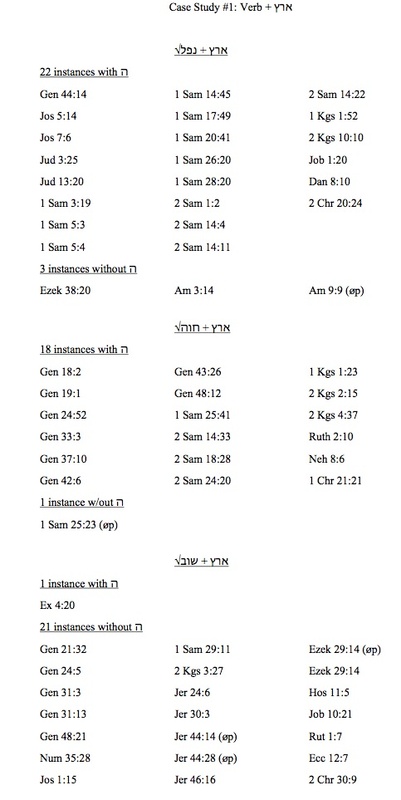 Genesis yields eleven, Samuel yields ten, and Kings yields eleven instances. Nonetheless, all things must be borne in perspective. 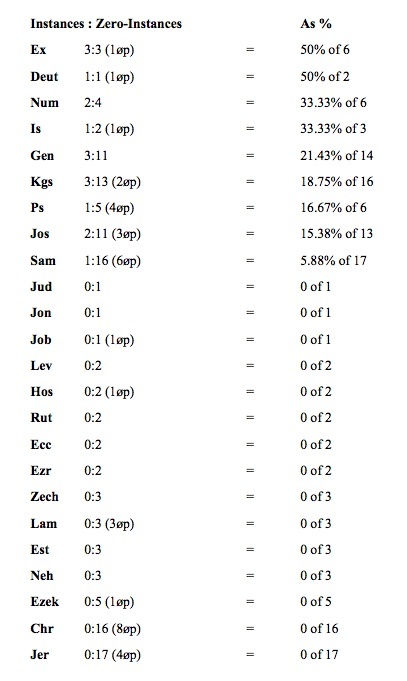 The number of zero-instances in Genesis is only eleven, but in Samuel and Kings it is as high as sixteen and eighteen, respectively. The number of zero-instances in Chronicles may appear here to be disproportionately high, but it is evident that Chronicles is merely continuing the same trend found in each of the other texts within this sample. Every one of these texts indicates that the locative-heh was not favourable when the noun served as the direct locative object of √הלכ. Furthermore, one must also bear in mind the nouns with which the verb √הלכ is appearing in each of these instances. Among the thirteen different nouns that feature in the zero-instances of Chronicles, nine of them never appear with a locative-heh in the Bible at all (גוי, עם, חומה, עציון, אילת, יהודה, רמות, גיא and צקלג). 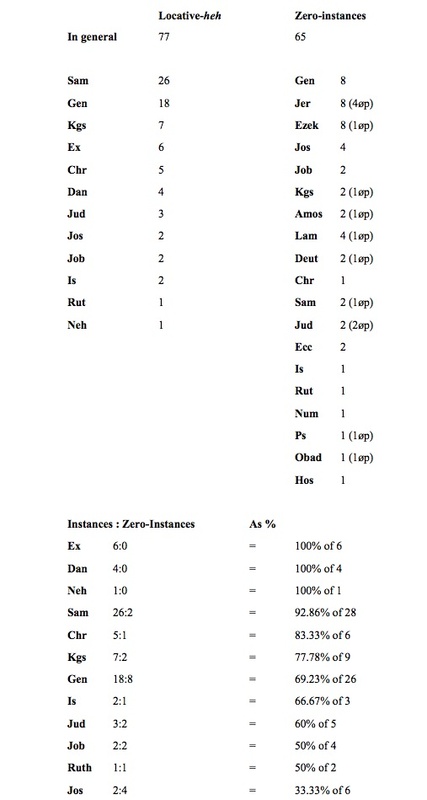 When one considers that among the eleven zero-instances in Genesis one finds words like בית (which appears thirty-four times with a locative-heh) and ארץ (which appears eighty-seven times with a locative-heh), one may appreciate that the zero-instances in Chronicles are based more upon the usage of a different lexicon than they are upon a declining suffix. Once again, we find that Chronicles still appears to fare poorer than the others, but with the unpropitious forms removed it is easier to appreciate just how similar Chronicles is to Genesis, Joshua, Judges, Samuel and Kings. 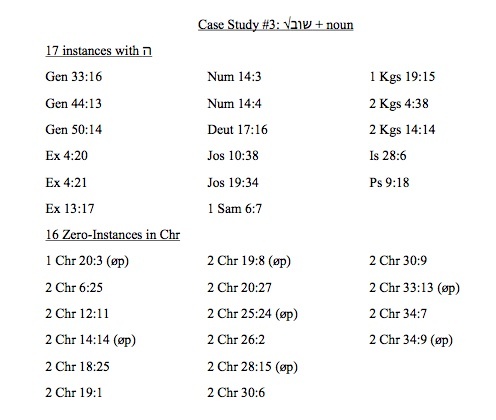 This is especially evident when we look at those cases within this sample that feature neither preposition nor suffix: while Chronicles has as many as seven such instances, Samuel and Kings have five and nine respectively. It would appear from this sample that, if there had been a trend within the Bible to move away from the locative-heh, that trend manifested itself within the EBH-related corpus as well. Of the 146 instances within which √שוב takes a direct locative object, 129 of them lack the locative-heh, or 88.36% of the total. With so few positive instances, comparing the prevalence of zero-incidents in these examples is a difficult task. Chronicles here has one of the highest counts of zero-incidents, and such may be taken by some as evidence that the author of the book is eschewing the usage of the locative-heh. Nonetheless, it finds itself situated among the EBH Genesis, Joshua, Kings, Samuel and Jeremiah. Ranking slightly higher than Jeremiah, Chronicles is only differentiated from Samuel by the existence of a single positive instance in the latter. I was not able to isolate the number of zero-instances in each of the other texts (as a primary search indicated that there was over 6500 altogether) although it is worth noting that, so far as positive instances are concerned, Chronicles fares better than Exodus, Numbers, Judges and Joshua. Even so, it receives markedly fewer instances than do Genesis, Samuel and Kings and, what is more, Chronicles fares particularly poorly once we take into account the relative sizes of the individual texts. Nonetheless, with a density of 0.51%, Chronicles ranks higher than the EBH Joshua and Numbers. I mentioned that, of the 71 instances within which √בוא takes a locative object in Chronicles, a total of 62 of them fail to feature the locative-heh. This, in itself, would seem to suggest that the suffix was diminishing by the time of this text’s composition although the nouns with which the suffix is failing to appear need to be borne in consideration. In those 62 instances, there are a total of 30 different nouns. 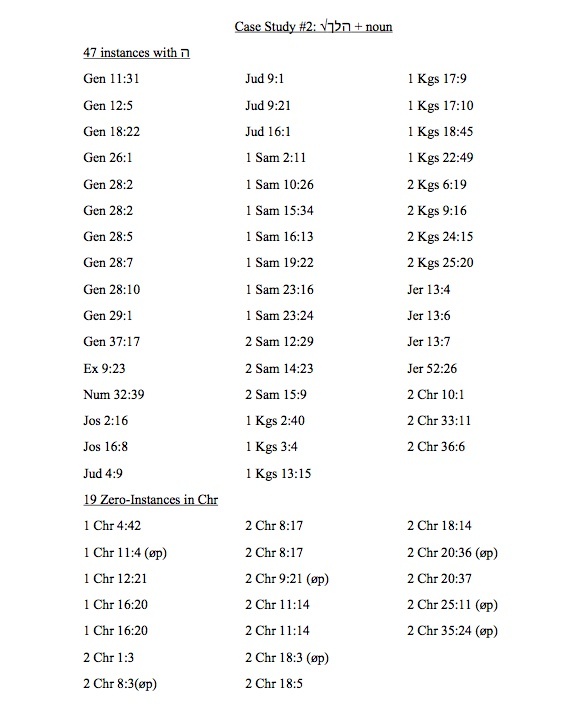 Of those 30 nouns there are only 8 that ever receive the locative-heh in the Bible at all, allowing us to drop our tally of zero-instances by almost half. Of those 8 there are a paltry 4 that ever receive the suffix more than 10 times. In conclusion, the long-held assumption that locative-heh forms are greatly reduced within Chronicles does not stand up to investigation. This assumption has been based upon simplistic notions of linguistic dating and is belied by the actual evidence from the texts themselves. To prove this assertion, I conducted several case studies and looked at a total of twenty-four instances of the locative-heh appended to the end of a noun within Chronicles: just over 40% of the total. The twenty-two verses that featured positive instances were chosen randomly and are believed to be symptomatic of the whole. • Situations within which LBH Chronicles seems to disproportionately favour the preposition over the suffix are due to the constraints imposed by the lexical items with which the suffix is expected to appear, and are not due to the redundancy of the suffix itself. • The chief criticism given of my paper was that I saw fit to include the synoptic sections of Chronicles in my studies. This, in itself, is not necessarily a great criticism; the great criticism comes of the fact that my statistical tabulation does not take that factor into account. I intend to rectify this problem and post corrected tables on this blog, although the process of doing so is a time-consuming one and I would not expect such corrections to be posted before January, 2008.